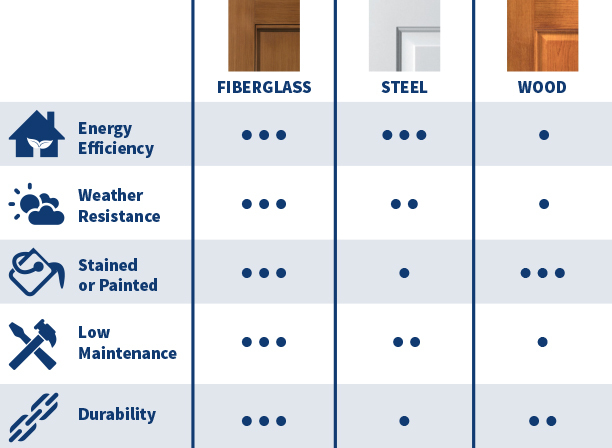 Choose the right door for your home. Look at it. Touch it. Knock on it. A fiberglass door looks and feels just like real wood. But it won’t warp or rot like a wood door – or dent or rust like a steel door. Feel warm and inviting to the touch – like a real wood door. Offer the best advantages of wood and steel – without the limitations. Energy efficient – offer good insulating value. Less maintenance, depending on the environment – won’t warp or rot like wood. Easily dented and scratched – which can lead to rust. Can only be painted, not stained – and paint chipping can be common. Conduct temperature – can feel cold or hot to the touch. Offer beautiful wood grains for a high-end look – can be stained or painted. Feel warm and inviting to the touch. Scratches can be easily repaired. Require regular maintenance. The finish will fade – refinishing recommended every 1–2 years. Absorb moisture – which can cause the finish to peel or bubble, and doors to warp or rot. Least energy-efficient option compared to our fiberglass and steel doors.